It’s been nearly two years to the day since North Carolina Central football lost a game to a MEAC opponent. After three-quarters, it looked as if South Carolina State had done enough to bust the streak in the Bull City. 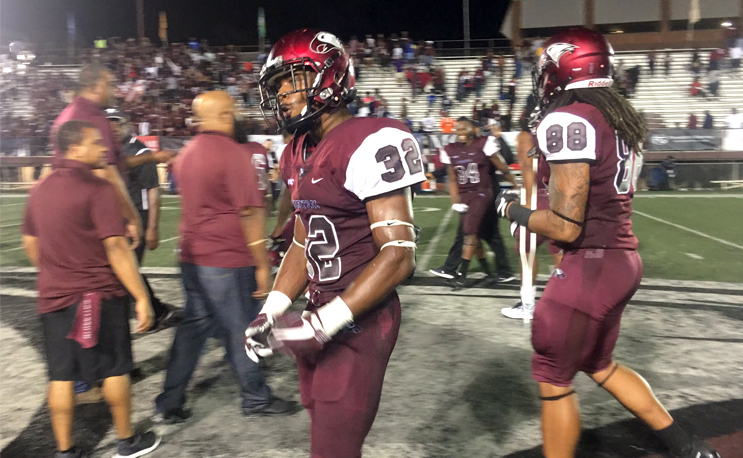 But NCCU pulled off a fourth-quarter comeback to win it on Thursday night, 33-28. Davanta Reynolds started the scoring for the Eagles with a huge fumble return for a touchdown early in the first quarter. He forced a fumble by South Carolina State quarterback Dewann Ford at the NCCU 15-yard line, returning it 85 yards for the score. Ford made amends with 22 seconds remaining in the first, finding Kendall Cobb for a 20-yard touchdown making it a 7-7 game. Ford would pick up two more touchdowns in a row pushing the score to 21-7. Running for a seven-yard score with 11:47 before the half, and following it up with a 26-yard TD to Quan Caldwell. With just under nine minutes to go before the half, the Bulldogs were enjoying a 21-7 lead on the road. After that score, ESPN listed their win probability at eighty percent. The Eagles would get back on the board with 2:48 to go in the second quarter, Chauncy Caldwell hit Jordan Fieulleteau on a 27-yard score. That was the exclamation point on a 9 play 76-yard drive that ate up nearly six minutes of clock. For those of you who enjoy the halftime entertainment as much as the game here’s a treat. Our Steven J. Gaither captured the NCCU “Sound Machine” and even made a cameo. Kickers steal the show in the third as Aedan Johnson knocked in a 35 yarder and a 41 yarder, pulling the Eagles to within 21-20. The Bulldogs, however, would ring the bell again just before the end of the third quarter. Ford on his feet again, this time rushing for a 9-yard score to put S.C. State back on top 28-20 entering the fourth. From that point on it was closing time for the Eagles. Naiil Ramadan got into the action hitting Jacen Murphy for a 20-yard score, but the Eagles failed on a two-point conversion. Despite the 70-yard drive, the two-point deficit was enough at the moment to break the Eagles two-year win streak. Until Caldwell got back under center and found Josh McCoy on a 38-yard touchdown strike right down the seam. The Eagles went up by five with just over five minutes to play and hung on for a Thursday night thriller in Durham.